By GreenEyedLillies on July 28th, 2009 . Filed under: Baby, Clothing, Kids . 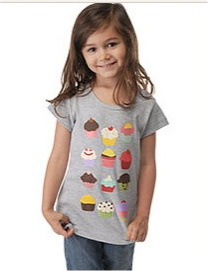 Everyone loves cupcakes, especially here at Paul Frank! This tee is a delicious mix of standard screenprint, high density ink, puff ink, and crystallina, on a short sleeve 100% cotton fitted rib tee. Comes in Heather Grey or White. Sizes 2T to 6X.